UpdraftPlus are happy to announce that we have released a brand new update: UpdraftPlus 1.16.7. As well as the new incremental backup via UpdraftCentral feature, the latest update comes with a many other features, fixes and tweaks. As you may have read in our recent blog, we have been hard at work making incremental backups more user friendly, with quicker and easier to use features. With this latest development, users will not have to go to each individual website every-time you want to make or schedule an incremental backup. Instead, UpdraftPlus users will have the option to make the incremental backups straight from their UpdraftCentral dashboard. We hope you enjoy these new features and if you have any comments, be sure to let us know in the comments section below. The post UpdraftPlus 1.16.7 update released – New features include the ability to take incremental backups via UpdraftCental appeared first on UpdraftPlus. UpdraftPlus – Backup, restore and migration plugin for WordPress. UpdraftCentral have released a brand new update: UpdraftCentral 0.8.5. This update comes with a great new feature and a couple of helpful tweaks. As you may have seen in our recently blogs, UpdraftPlus have recently launched Incremental Backups. This was a big development in WordPress backups as it allows users to only update new changes that have occurred since the last backup, rather than starting a new full-site backup every time. This helps with the excessive resources which are used when performing a full site backup, which can also help users with low resource servers. We have been working hard to make Incremental Backups even more user friendly, so the latest update of UpdraftCentral allows users to control all their Incremental Backups from one place using the UpdraftCentral dashboard, available with UpdraftPlus Premium. You’ll be pleased to hear that this new feature means no more switching back and forth between every single one of your sites every-time you want to schedule an Incremental Backup. The post UpdraftCentral announce new dashboard control of Incremental Backups with 0.8.5 release appeared first on UpdraftPlus. UpdraftPlus – Backup, restore and migration plugin for WordPress. Managing multiple WordPress websites can be challenging. It involves logging onto each dashboard separately, handle all the updates, manage comments and then carry out the operations. Faced with the same situation, our CEO David Anderson decided to do something about it and created UpdraftCentral as part of the UpdraftPlus plugin. You can even try it for free! Yes, you heard that right! You can now manage up to 5 sites – free of charge on UpdraftCentral. Adding a site to your UpdraftCentral dashboard is quite simple. All you need to do is install the UpdraftPlus free or UpdraftPlus Premium plugin on your WordPress site. The premium version of UpdraftPlus comes with several handy features that are not available with the free version. If you would like to read more about the comparison between both the free and premium versions, please click here. After you have installed and activated UpdraftPlus on your site, create an encrypted key that acts as the site identity on UpdraftCentral. Go to the ‘Advanced Tools’ tab of UpdraftPlus setting page. On the left side, you see ‘UpdraftCentral’ – Click on it. You now see a section heading – “Connect this site to an….”. Inside you get a button ‘Updraftplus.com’ – click on it. Next you will see a dropdown for ‘Encryption key size.’ Keep the default value as it is and click on the ‘Create’ button. UpdraftPlus creates an encrypted key for UpdraftCentral. Now head over to your UpdraftCentral dashboard at https://updraftplus.com/my-account/updraftcentral-remote-control/. Go to ‘Sites’ and click on the ‘+’ icon in the top-right corner. This opens a pop-up where you can paste your key. Once you have added the key, you will see your site listed under UpdraftCentral. Repeat the same process for any other sites you may want to add to UpdraftCentral. 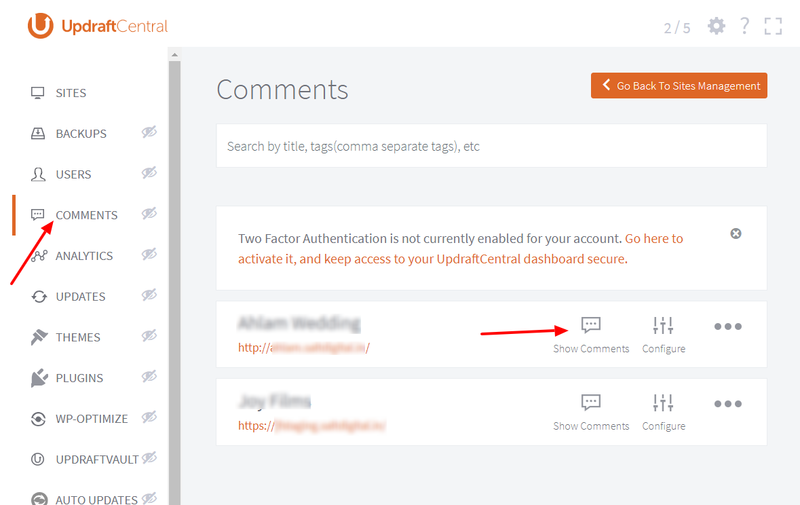 With UpdraftCentral, you can efficiently manage all of the comments from all of your sites from one central location. Posted comments automatically sync to the UpdraftCentral dashboard in the background. You can then carry out all the same operations that WordPress provides for comments such as – approve or disapprove comments, reply to comments, edit or trash the comment or mark as spam. Let’s take a look at UpdraftCentral in action. First, go to the ‘Comments’ section of your UpdraftCentral dashboard. In this section, you get a list of all of your connected sites along with the options ‘Show Comments’ and ‘Configure.’ You can configure all of the comments settings by clicking on ‘Configure’ which opens a pop-up window from where you can choose the settings. To approve comments click on ‘Show Comments,’ after which you get a list of all the comments your site has received. You can view details including comment author, comment date and comments article. To approve a comment, click the ‘Approve Comment’ button, which will automatically publishes the comment on your site. You can then perform the same process and approve comments on your other UpdraftCentral connected sites from the dashboard. Join UpdraftCentral for free and to start taking advantage of these amazing time-saving features. You can also read more about how UpdraftCentral will now allow you to install a new plugin or theme on all your WordPress sites at one here and about David’s journey with UpdraftCentral in this exclusive interview. 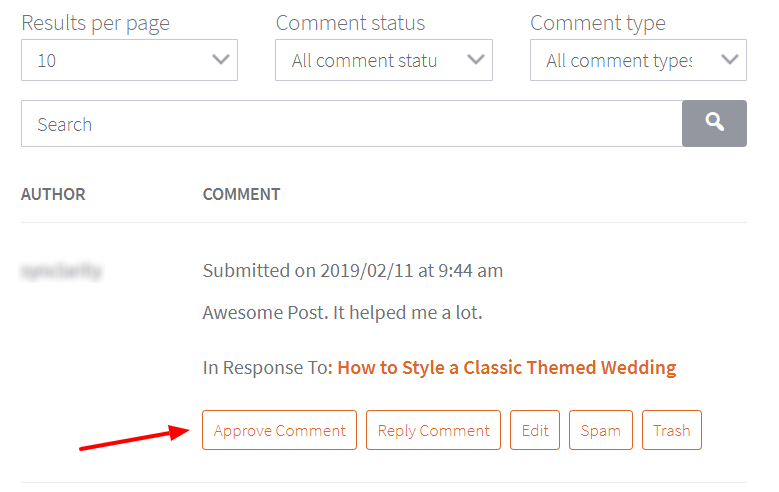 The post How to approve comments on all the sites you manage from one location using UpdraftCentral appeared first on UpdraftPlus. UpdraftPlus – Backup, restore and migration plugin for WordPress. We are pleased to launch an updated version of UpdraftCentral 0.8.1 that now features new fixes and tweaks. Just some of the new tweaks include enabling the Easy Updates Manager module and the backup settings UI. We recommend this update for all. The post UpdraftCentral 0.8.1 released appeared first on UpdraftPlus. UpdraftPlus – Backup, restore and migration plugin for WordPress.